Strengthening ASSR’s ties with music and recording technology institutions, on Nov 5th & 6th 2011 students at the USC Thornton Popular Music Program in Los Angeles will get to work with Alan Parsons at the prestigious Village Studios in West LA. Over two days Alan will discuss his recording and production career and then conduct a recording session of an original song performed by some of the students. This session will provide a hands-on learning experience for students and introduce fundamental recording, arranging, production, and mixing techniques. These sessions are part of a required class for Popular Music majors at USC called the Popular Music Forum. Popular Music Forum is a guest artist series designed to give insights into the music industry and profession. Other guest artists who are a part of the course this fall include Fred Wreck (producer with Dr. Dre and Snoop Dogg), Glenn Frey (co-founder of the Eagles), Linda Perry (hit songwriter and producer), Trevor Rabin (film composer), Tena Clark (CEO of DMI Music and Media Solutions), Darrell Brown (hit songwriter and producer), and Tom Johnston (co-founder of the Doobie Brothers). 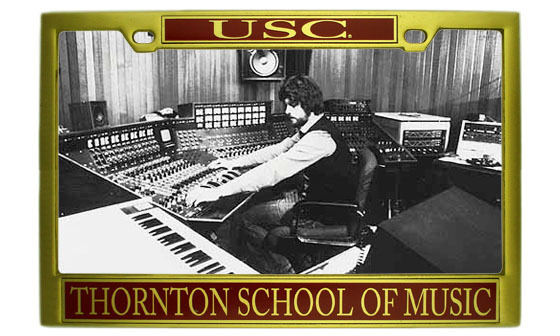 USC Thornton’s Popular Music Program is unique within the music conservatory model and created as a rich multi-disciplinary hub for rock, pop, R&B, folk, Latin, and country artists. Set within the vibrant creative center of Los Angeles, the program ushers students into all the facets of the pop music scene, and the Forum is an integral part of that goal. More at www.usc.edu/music, or call (213) 740-3233.